Free TWO day training on trauma and attachment with experienced presenters. Day Two builds on Day One, so plan to attend both days. Participants will receive a workbook, training certificates, and practical tools to take home and use immediately. Registration is required in order to ensure there are enough materials. This is a live Simulcast in Fenton, MI of the conference as it happens in Fort Worth, Texas. No childcare and lunch is on your own. You are welcome to pack a lunch or go out and grab something from one of many local restaurants. Join us for the 4th annual Clara’s Hope Auction. Exciting items and experiences to bid on, plus it is just a fantastic night! Genesee County Under-sheriff Chris Swanson will be our auctioneer. Childcare available on a first come, first serve basis and pre-registration information will come with your email confirmation of ticket purchase. Join Salon 416 in Downtown Fenton as they offer haircuts for just $20 and eyebrow waxing for just $5 As a fundraiser for Clara's Hope during the Art Walk. Just walk up and you can get a high quality salon service at a fraction of the cost for a great cause. Leading up to and throughout the month of May, Clara's Hope collects items for first night foster care backpacks. Hundreds of backpacks are stuffed with new pajamas, socks, underwear, blanket, flashlight, toothbrush, toothpaste, coloring book/journal, crayons/markers, pens, and much more. Every child (baby to teen) should have what they need for their first night in foster care. They have enough to worry about without having to wonder how they are going to brush their teeth. A fun-filled night of food, a large variety of silent auction items, and an enthusiastic and entertaining live auction. All funds raised go directly to supporting foster and adoptive families in Genesee and Livingston Counties. Tickets will be available for purchase at eventbrite starting January 1, 2018! 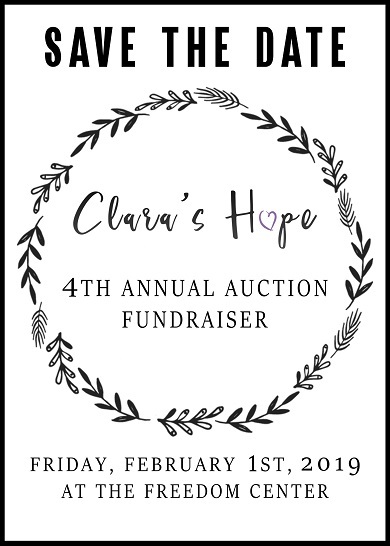 The Third Annual Clara's Hope Auction! Interested in learning more about what's involved with foster care? If you want more information, have questions, or are considering becoming a foster parent, plan to attend. Kick-Off Team Meeting for the Third Annual Clara's Hope Auction! This is our major fundraiser each year and we couldn't do it without the help of tremendous volunteers. Join us to see how you can get involved. Join us to put together the first night bags for children entering foster care. Email Erin at clarashope61@gmail.com for volunteer and for details. Clara's Hope director, Tami Kromer, will share some practical ways to create structure and routine in your family. Simple and proven ways that can help reduce stress and increase joy. We do need to know how many will be in your party so we can plan accordingly. *No childcare is available for this event. Be sure to join us for the 2nd annual silent auction at The Freedom Center. Tickets will be available on eventbrite in January 2017. Gathering to collect finished baskets & brainstorm/plan to make this auction a fabulous success.